Progress in Voting? Progress in Education? In sum, the Supreme Court decision handed down on June 25, 2013, revoked the government’s ability to pre-approve—or not—restrictions any state might place on voting, especially those states, mainly in the South, which had a historic record of voter discrimmination, directed mainly at blacks. 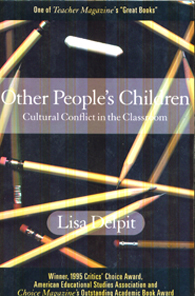 The case revolved around basically the same question I was just exploring with my graduate students exactly one week before as we read Lisa Delpit’s classic, controversial book Other People’s Children in my course Race, Ethnicity, and the American Experience. There Delpit indicted the very nature of American education and the education of American teachers for being so thoroughly white they largely misunderstood the needs of minority children and all teachers, minority or white, who would teach them. Do the same conditions exist now for voting as those that existed in 1965? Do the same conditions exist now that existed for education issues in 1995, the year Delpit published Other People’s Children? Delpit’s case presents a much clearer picture. Study after study shows relatively little progress in the problem areas she identified: educational philosophy and teacher training tuned specifically to white middle and upper class students = a systemic disadvantage to minority students. Well-meaning, but ultimately deaf “progressives”—ones who based their philosophies on “academic” research and trendiness without listening to minority voices—were, she said, perhaps more at fault than anybody. On the other hand, as Justice Roberts pointed out, in some Southern districts black voters now outnumber white, and two of the most notorious cities now have black mayors. However, attempts to obstruct minority voters were flagrant in many districts during the 2012 election, especially in Ohio, Pennsylvania, and Florida; and Texas is now moving swiftly to instate voter ID laws and to redraw districts in ways that will probably make it harder for blacks and latinos to vote effectively. There’s much to indicate that we see racism less today only because it’s been driven more underground. It’s still huge, but it’s not “politically correct” to be overtly racist. The Court’s decision could drive more racism above ground, as the swift Texas response indicates. One person commented that it was hard not to think the conservative justices were looking for ways to bolster Republican chances, as the Republican base—older white men—decreases, while young whites turn increasingly independent and blacks and latinos remain solidly Democrate. Personally, I don’t think the justices are this blatantly “political,” a view which causes my progressive friends to laugh loudly in my face. I believe they’re “ideological,” though I suppose this often—though not always—amounts to the same thing. As for education, things still seem to move at a glacial pace. There’s still so much systemic inequality in education, much of it the same as Delpit pointed out nearly 20 years ago. And things adjacent to education aren’t fairing much better: the state of children’s books, for example. A recent NPR report—see it HERE—called the world of children’s books “stubbornly white” even as demographics undergo a seismic shift. If it all starts with education, as most of us believe, it will be a long time before social and political equality become more entrenched, if ever. Or perhaps it starts first with politics? If so, this June’s Supreme Court decision vis-a-vis the Voting Rights Act doesn’t bode well for much faster progress either. √ Go to the Teaching Diversity page. √ Go to the Reviews & Commentary page. This entry was posted in Reviews & Commentary, Social Change and tagged Lisa Delpit, Other People's Children, race and education, Supreme Court, Voting Rights Act. Bookmark the permalink.